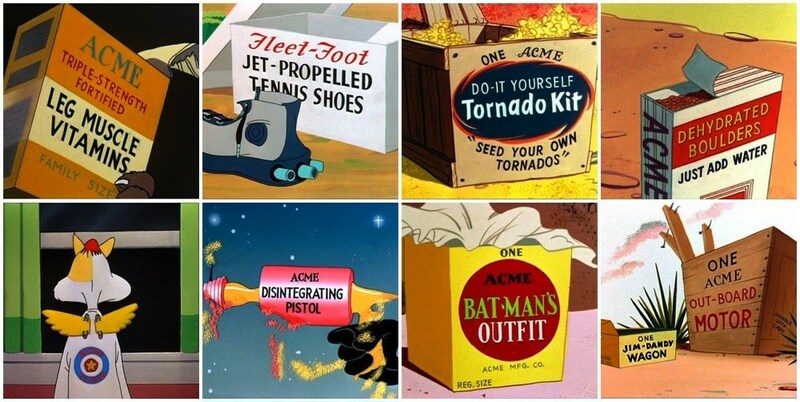 Now that Looney Tunes is on-topic, maybe I can get an answer for something I've been wondering about for a while: Looney Tunes characters, (most famously Wile E. Coyote), always use products with the brand name ACME: Do they ever use products anywhere from a different fictional company? 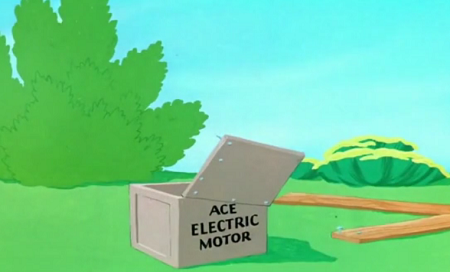 In Fast and Furry-ous (1949) Wile E. Coyote uses an "Ace" brand electric motor. 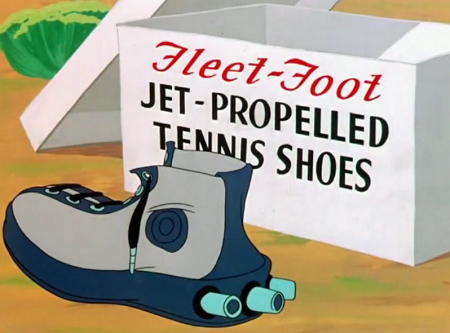 and "Fleet-Foot" jet-propelled tennis shoes. In Beep, Beep! 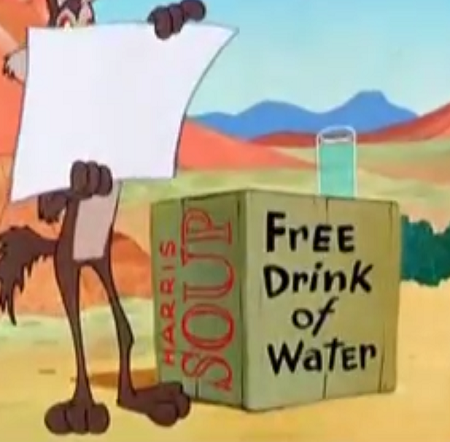 (1952) Wile E. Coyote uses an empty "Harris Soup" box as a stand. This, presumably was an homage to animator Ken Harris. 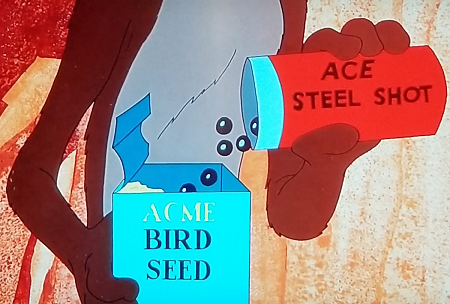 In Zipping Along (1953) we see another Ace product, steel shot. In Ready, Set, Zoom! 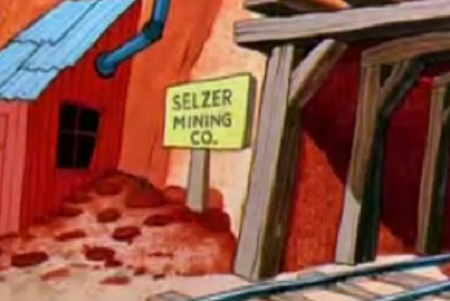 (1955), our hapless protagonist travels through a mine owned by the "Selzer Mining Co.", presumably an homage to producer Eddie Selzer. In Zoom and Bored (1957) Wile E. Coyote has gotten himself an "Ahab" branded harpoon gun. In Going! Going! Gosh! 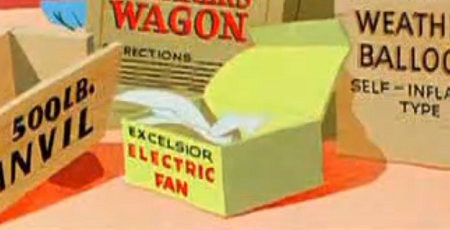 we find that Wile E. Coyote has bought an "Excelsior" branded electric fan. 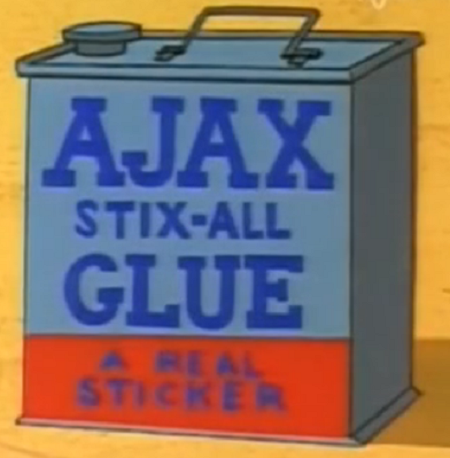 In Rushing Roulette (1965) we encounter "Ajax" brand glue. 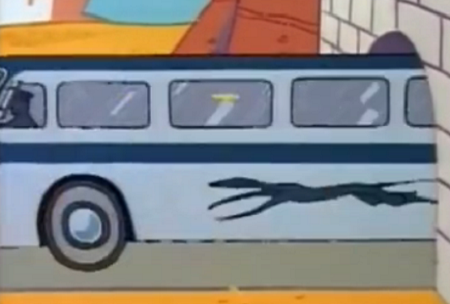 and what appears to be a Greyhound branded bus. Note that this is a real brand, not a fictional one. 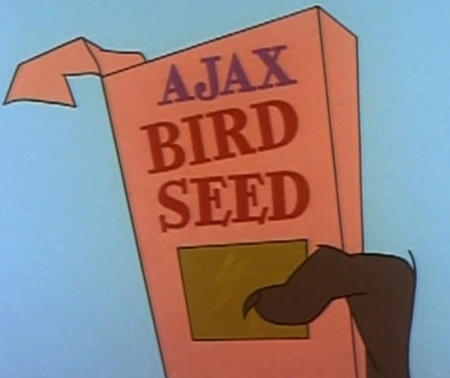 In Zip 'n' Snort (1961) we also see another Ajax product, bird seed. 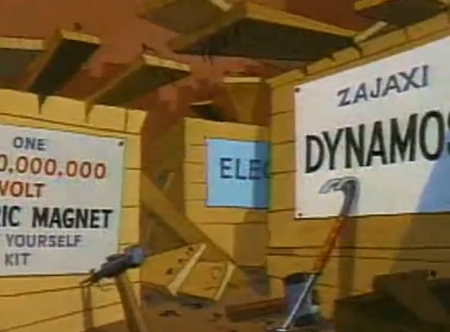 In Compressed Hare (1961), Bugs Bunny orders a "Zajaxi" branded dynamo to use against Wile E. Coyote. 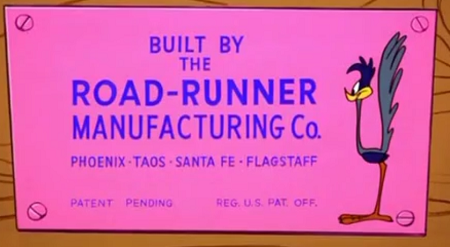 In Adventures of the Road Runner (1962) we see that Wile E. Coyote has foolishly been buying "Road-Runner Blue-Print Co." branded blueprints. 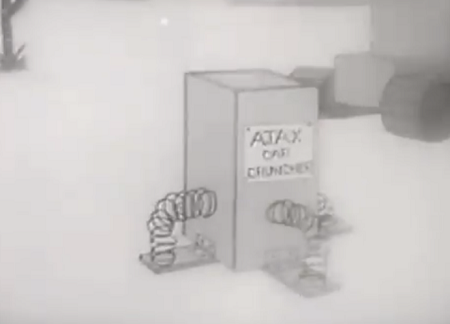 In To Beep or Not to Beep (1963) we see that the Wile E. Coyote has foolishly bought a giant (and consistently defective) catapult from the "Road-Runner Manufacturing Co."
In this series of Plymouth Cars commercial (this one from 1968), we learn that Ajax also manufacture rocket cars. 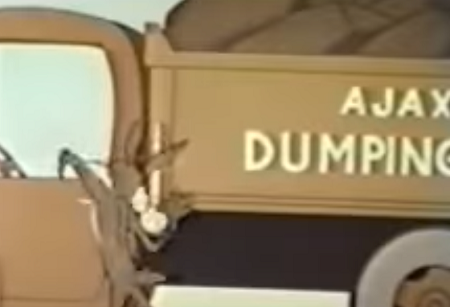 In the 1969 commercial, we see that Ajax have diversified into 'dumping'. 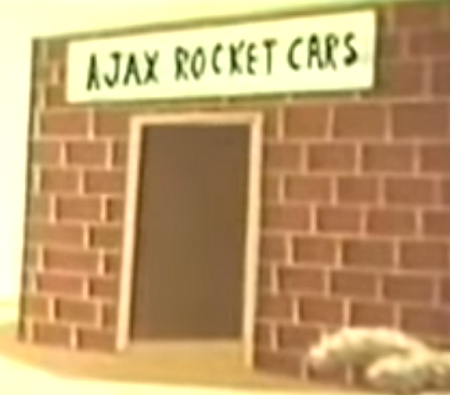 And in this 1970 commercial, Ajax evidently sell 'car crushers' as well. In a series of commercials for Energizer Batteries, Wile E. Coyote finds that their fictional rival brand "SUPERVOLT" are (as usual) underwhelming. 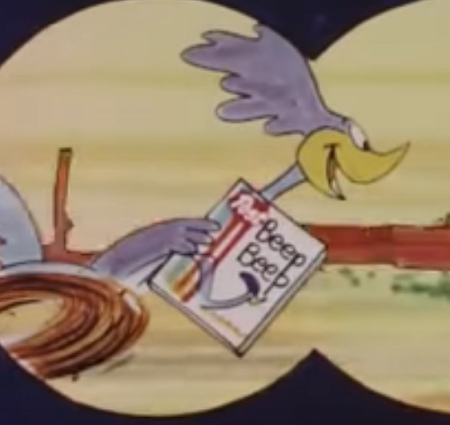 In the late 1960s, Warner Bros came up with the idea for a branded Road Runner cereal called "Post's Beep Beep Cereal" and even went as far as mocking up an animatic to show Post Cereals executives what the advert might look like. Since the brand only existed on paper (the deal wasn't finalised), this seems to fall into the category of 'fictional'. 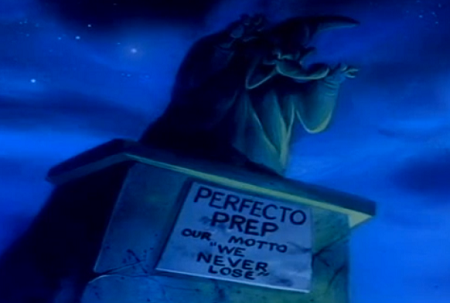 In Tiny Toon Adventures, toons have a choice of attending Acme Looniversity or its rival, "Perfecto Prep" as seen in The Acme Bowl (1990) and other episodes. 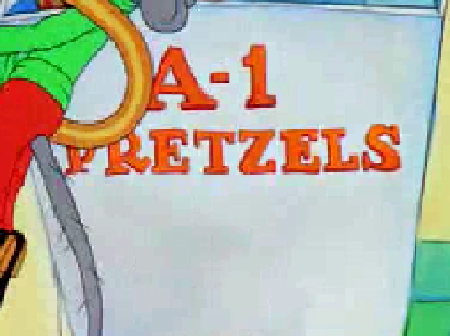 In Duck Dodgers In The 24½th Century (1952) Marvin has a tendency to use "A-1" branded products, a brand that's also seen (occasionally) in the early Looney Tunes cartoons. 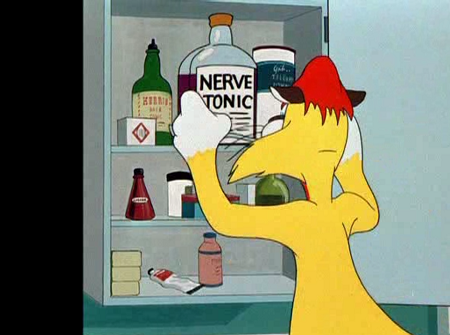 In Cheese Chasers (1952) Hubie and Herbert raid a cheese factory called "Hunka Cheese Co."
In Mouse Wreckers (1949), Claude Cat has a green bottle of "Harris" hair tonic in his medicine cabinet. 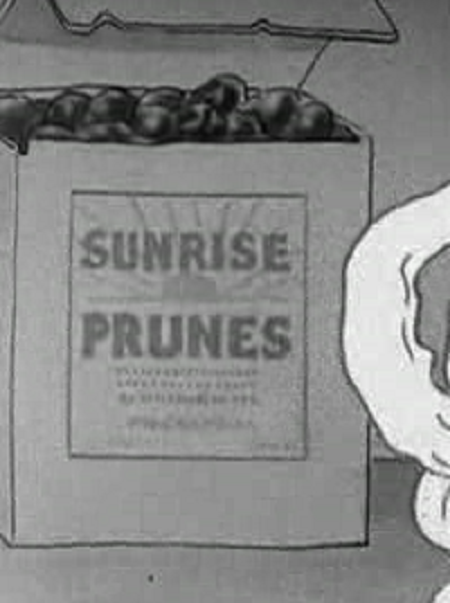 In The Dish Ran Away with the Spoon (1933), we see some "Sunrise" prunes in the background of the kitchen. 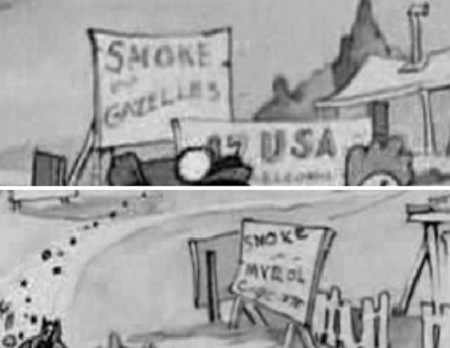 In Buddy's Day Out (1933), our hero is implored to smoke "Gazelles" cigarettes and "Myrol" cigarettes. 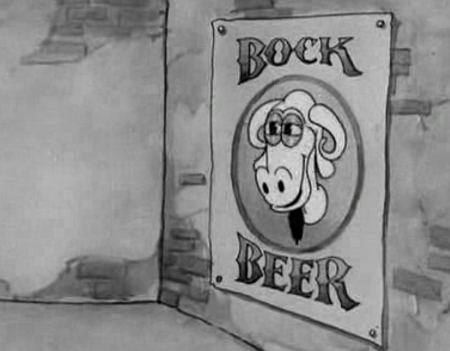 In Buddy's Beer Garden (1933), Buddy serves "Bock" beer. 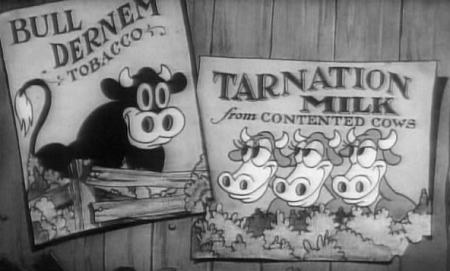 In Sittin' on a Backyard Fence (1933), the alleycats are sitting on a fence with posters that advertise two distinctive brands; "Bull Dernem" tobacco and "Tarnation" milk. How Do I Know It's Sunday? 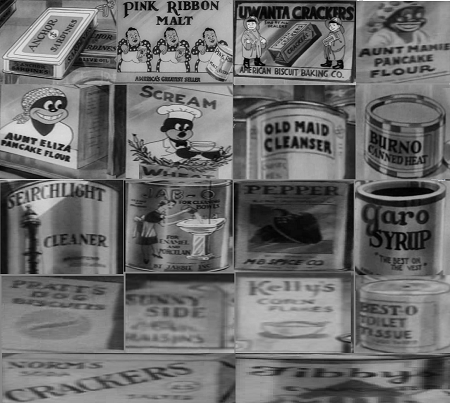 (1934) features a veritable cornucopia of fake and parody brands; "Anchor" sardines, "Pink Ribbon" malt, "American Biscuit Baking Co." crackers, "Aunt Mamie" and "Aunt Eliza" pancake flour, "Scream" wheat, "Old Maid" cleanser, "Burno" canned heat, "Searchlight" cleanser, "Jamble Inc." cleaner, "MB Spice Co." tinned peppers, "Garo" syrup, "Pratts" biscuits, "Sunny Side" raisins, "Kelly's" corn flakes, "Best-o" toilet paper, "Norm's" crackers and "Tibby" evaporated milk. 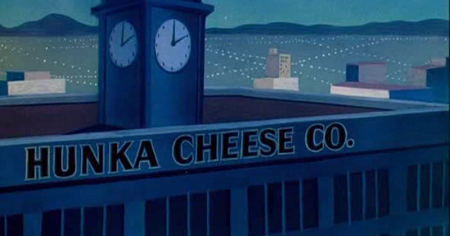 In Milk and Money (1936), Porky Pig works for the "Fuller Water Milk Co." as a milkman. 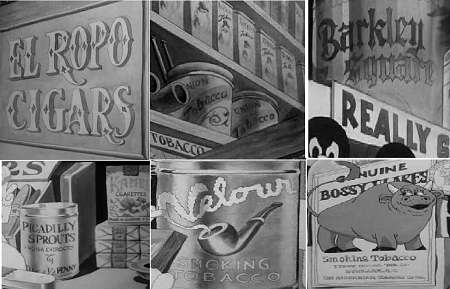 In Wholly Smoke (1938) Porky Pig encounters a range of cigarette brands; "El Ropo" cigars, "Union" tobacco, "Barkley Square" tobacco, "Picadilly Sprouts" cheroots, "Velour" smoking tobacco and "The Hibernian Tobacco Co.", makers of 'Genuine Bossy Flakes'. In You're An Education (1938),we learn that travellers can travel via a boat from the "Alaska Steamship Company"
In The Night-Watchman (1938), Tommy Cat walks past another A-1 product, a box of pretzels. In The Sour Puss (1940) we see another company name, "Consolidated Pants". 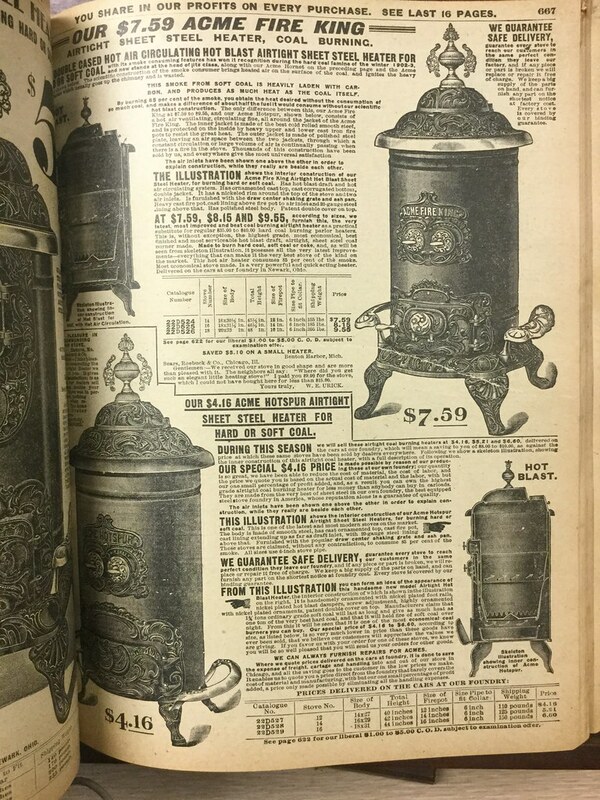 Interestingly, this is also the first mention of "Acme" as a company name. 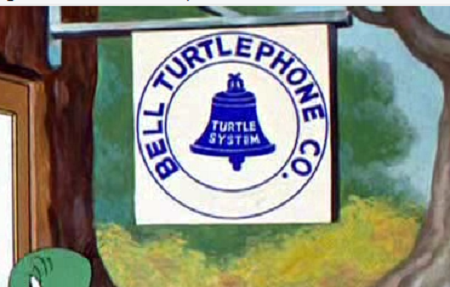 In Tortoise Beats Hare, Cecil Turtle uses a "Bell Turtlephone Co." branded telephone box to call his family. 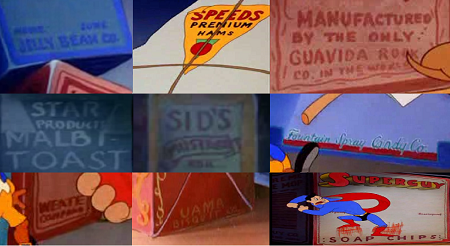 In Goofy Groceries (1941) we see another slew of fake and parody product names and company names; "Jelly Bean Co." jelly beans, "Speeds" premium hams, "Guavida Rock Co.", "Star Products", "Sid's" mustard, "Fountain Spray Candy Co.", "Weate Company", "Uama Biscuit Co.", "Superguy Co." soap chips. 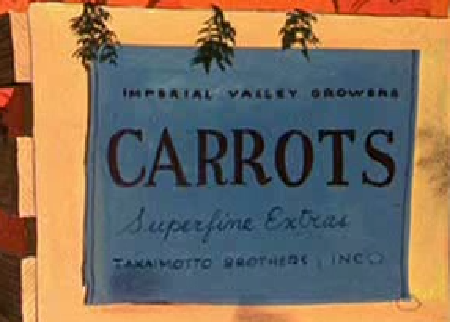 In Baseball Bugs (1946) we see a couple of brands; "Ross Co." shoes and a "Mellow Cab Company" taxi. 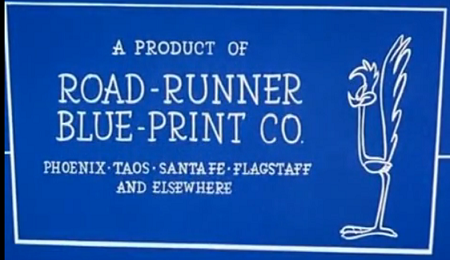 In Rabbit Transit (1947) we see another telegram company; "Western Bunions", another obvious parody of Western Union. 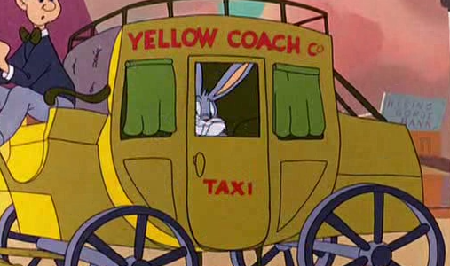 In Slick Hare (1947), Bug Bunny eats carrots grown by the "Takaimotto Brothers, Inc."
In Bugs Bunny Rides Again (1948) we see another taxi company; "Yellow Coach Co."
Not the answer you're looking for? Browse other questions tagged looney-tunes .